Your goal is to kill as much stuff as possible. Fly with the W, A, and D keys. Shoot by clicking and hoolding the left mouse button. Your rage bar is filled a bit every time you either kill an enemy or take damage. When the bar is full and flashing you can releash your rage by pressing shift This kills everyone on the screen. Powerups are dropped by enemies. To collect them just fly into one of the boxes. Each powerup lasts 25 seconds and the length is displayed in the HUD. 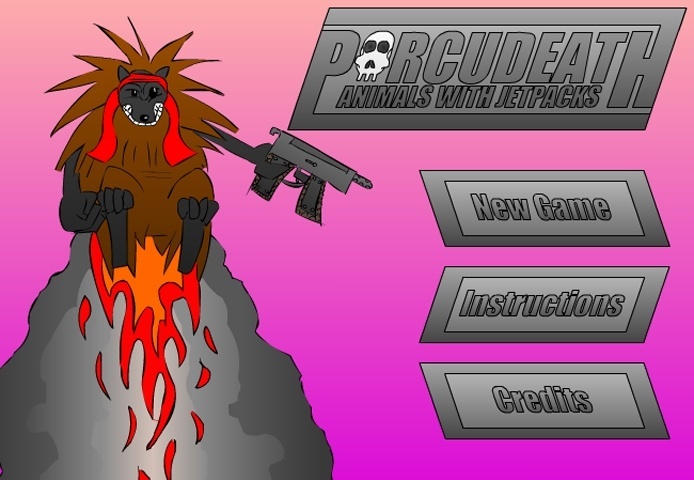 If you want to play Porcudeath Animals With Jetpacks games online you have come to the right place! GamesLoon adds new Porcudeath Animals With Jetpacks games every week. This is your game portal where you can find the biggest collection of free Porcudeath Animals With Jetpacks games online. Do not forget to rate our Porcudeath Animals With Jetpacks free online games while playing!